In August of 2015, I began my Etsy shop as a fun little side job and hobby. It's definitely been that since I started, but more recently, I've been considering expanding it - adding more categories and listings, etc. - and to do so, I realize that I need to increase my Etsy strategy and do more promoting than I've been. It's kind of crazy to add this to my plate, but it's something I enjoy doing. I've tried a few things here and there, but I definitely haven't been consistent and honestly, for not much of any promoting at all, I think my shop is doing okay. Etsy has grown so much and there are over five million active listings on Etsy right now. That's INSANE! As a small business owner/blogger, I love to go to Etsy to shop for almost everything. And as an Etsy shop owner, I know how important it is to help support each other if and when possible. Etsy is wonderful for unique items, gifts, and especially my favorite - monograms! There's endless amounts of things you can buy on Etsy and honestly, it's one of the best platforms to sell on if you ask me. But with selling comes the challenges of keeping up sales, keeping up with sales and gaining clients that are new and returning too. This is something I have yet to do so I'm a bit behind the game, but making an Instagram for your Etsy shop is just as important as it is to have an Instagram for your blog or any other small business. Instagram is by far one of the most popular, powerful and over utilized social media networks these days. No matter what you sell on Etsy, you should be utilizing Instagram. If you take note of hashtags, you'll also notice that some of the top, most engaging hashtags include #custom #etsy #handmade and #etsyshop. When I post pictures on my blog's Instagram having to do with my Etsy shop, I use these hashtags and always see a minimum of 20 more likes than I would have without those hashtags. The same goes for other social media such as Facebook and Twitter, but since Instagram is all about visuals, I would focus more on there. Etsy has a really, really useful Sellers Handbook right on their website. They cover everything from taking beautiful listing images, using SEO to get seen in more search results, seasonal tips, growth strategies and so much more. I've found dozens of articles and tips to help grow and the manual is a must read/see! When creating a listing, you can add up to 13 tags. These are similar to hashtags, and make your listing show up in search results that use said tags. The best way to figure out which tags you should use is basically by describing the product you're listing; describe it by color, size, function, etc. For example, if I'm going to list a new mug on my shop, I usually use tags like "mug", "custom mug", "personalized mug" and the saying that's on the mug. The more tags you use, the more search results you'll come up in. SEO, friends! ezebee.com is one of the newest, simplest ways to promote your Etsy shop. It's essentially like a free, online shop that allows you to promote your listings and your shop. It reminds me of Pinterest; it's basically like a newsfeed full of small shop listings that you can search through and find things to buy. This is a great way to get your shop publicized and get your listings seen to an even further extent. This index has a ton of articles on how to succeed on ezebee.com and they're all extremely helpful. Customers can create an account and simply buy right from the ezebee.com website. It's that simple! Since signing up and promoting my listings with ezebee.com, I've seen increased sales and an increase in shop views too. The great part about it is that even if you don't have an Etsy shop, you can sell on ezebee.com. I think it's so appealing because of the layout - scrolling through listings is the same as if you were scrolling through things to pin on Pinterest. 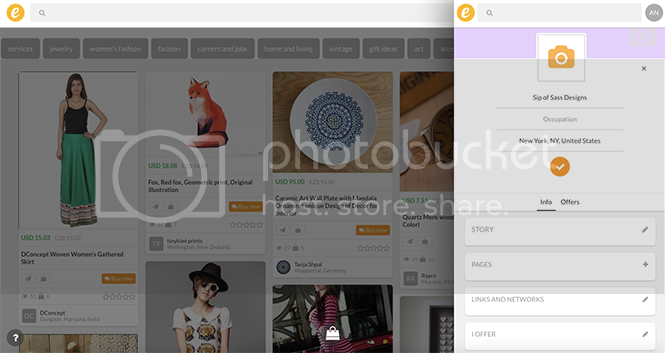 Here, you can easily edit tags, your "story", product and shop info, pricing and more. The more you fill out, the more likely it is you'll appear in searches. This is the most innovative way for small business owners of all kind to sell, buy and meet other business owners too. I love using ezebee.com - I mean, who wouldn't want to sell and buy products from an easy to use, innovative shop like this?! 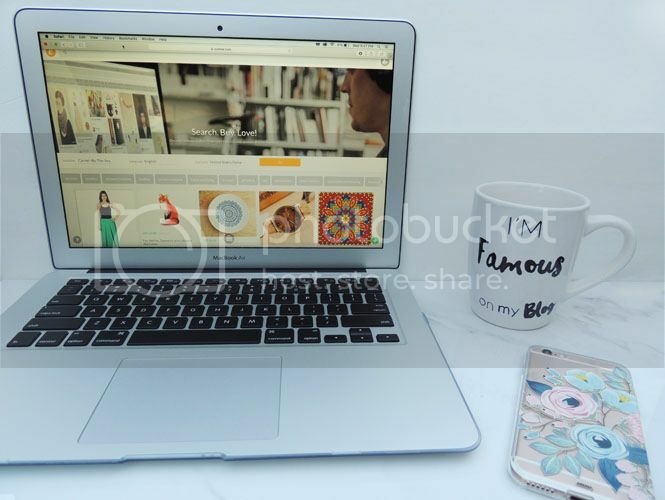 I highly recommend utilizing all of these tips to help grow your Etsy business, but signing up for and using ezebee.com is the best way to grow your small business. They're pretty new and already have a ton of listings and sellers; you can sign up here to buy and/or sell today! What do you do to grow your Etsy shop? My sister just opened up an Etsy shop so I am sending this to her. SHe will totally appreciate this. Great tips! I don't have an Etsy shop but have thought about starting one so I'll save this in case I decide to do that. And I absolutely love that mug!! This is really cool! I love how you can use them to grow your etsy shop in a Pinteret-ish style. haha. I think this is some neat tips! I like the ideas! I don't have an Etsy shop, but I'm a huge fan of the site. Even as a shopper it can be hard to find what you are looking for, which why these tips are so beneficial. I think the more Etsy shops who know about it, the better experience they can create for their users. Awesome post! I need to put more time into my esty shop! Social media for it is an area I am slacking. & I know that is probably hurting me! I love browsing through Etsy! But I've never had a shop there before. It's really nice to see how creative people are with their crafts wonderfully featured in their pages. Thanks for all the tips, I could totally use this someday! I love Etsy! I go there to find all of my party decor. I will def. be sharing this post with my friends who have their own Etsy stores. I have a friends who has an etsy shop, this would be great for her. I'm so glad that I found this, I need to re-launch my etsy store. I have been thinking about starting an easy page so this was very helpful for me! I don't have an Etsy shop but it's good to know what to do in case I ever decide to open a shop in the future. I do believe that social media plays a big role in getting your name and info out there. such a great tips, I don't have a Etsy shop but this a good starting for me. Amazing tips. Love them all. Thanks for sharing! I have an Etsy shop and it's tough to get known! Thanks for sharing this! I love to shop Etsy. Thesea re great tips for the owners. I am so glad that others are willing to share tips to help others be successful. We all need to work together. Thanks for the tips! I was really curious about Etsy for a very long time so your post comes in a good opportunity for me to learn about your experience. I will definitely check out EZEBEE. Thanks!